* midnight in the garden of good and evil.....! 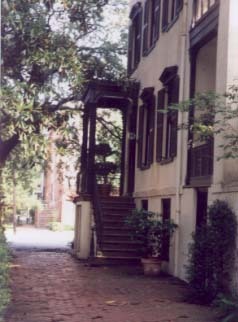 II knew nothing about Savannah until about a month before I went there. I hadn't even heard of it. When I mentioned it to people everyone seemed to associate it with the recently released book and movie - MIDNIGHT IN THE GARDEN OF GOOD AND EVIL. 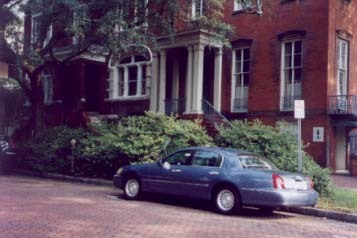 I was shown around downtown Savannah by the visitation manager of the Savannah College of Art and Design, and he made several references during the tour to the movie and the sinister side of Savannah, all of which was a bit lost on me. I have since seen the film, and now know something more of the haunted/voodoo background of the town. My brief visit however was far from sinister. I was astounded by the beauty of this small southern city. It reminded me of a hot little London. 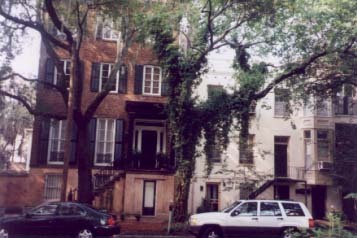 Majestic homes on treelined streets that emptied into park squares with fountains and monuments to southern history. The Savannah College of Art and Design itself is the most impressive educational institution I have ever seen. Spread across 56 campuses in the town centre, everyone of them has been lovingly restored by the college' s Historical Preservation department. Every building made my jaw drop in wonder. 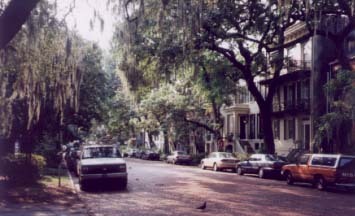 Jones St, pictured below, is the best and most famous example of gorgeous Savannah streets. 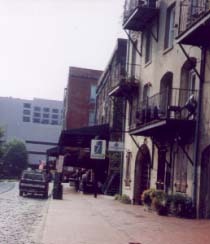 A long and cobbled road winds it way along the Savannah waterfront. The Savannah river is wide enough at this point to function as a port for large shipping, and this part of town is essetially for tourists - bars, cafes, souvenirs, etc.